Ministry of Health and Family Welfare, Government of India has issued the Standard Treatment Guidelines Portal hypertension. 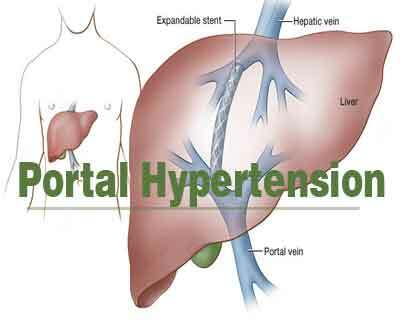 Portal hypertension is defined as elevated pressure in portal venous system due to resistance to portal blood flow. The site of resistance may be prehepatic (EHPVO), hepatic (cirrhosis and NCPF which is presinusoidal) and post hepatic (Hepatic venous outflow tract obstruction – HVOTO). The normal portal pressure is 5-10 mmHg. Pressure more than 10 mmHg is defined as portal hypertension. Since portal pressure or HVPG is normally measured in specialized Gastroenterology /Hepatology units, presence of varices along with evidence of liver cirrhosis or portal vein thrombosis / HVOTO in the presence /absence of ascites and splenomegaly is considered sufficient for diagnosis of portal hypertension. The true incidence of the condition is unknown. However variceal bleeding is one of the common causes of Upper gastrointestinal haemorrhage , accounting for almost half of cases (depending on referral pattern). Variceal haemorrhage is also the commonest complication of liver cirrhosis. Almost 90% of patients with cirrhosis will have variceal formation and 30% of all patients with varices are likely to bleed. Most patients with EHPVO and NCPF are also diagnosed after evaluation for splenomegaly and variceal bleeding. In children, variceal bleeding is most common cause of UGI bleeding in India, accounting for almost 90% cases with EHPVO responsible for the majority and NCPF and cirrhosis responsible for the rest. Since the etiology of EHPVO and NCPF are not fully known the prevention is mainly prophylaxis of bleeding or rebleeding. Simiarly, if HVOTO is diagnosed then etiology of probable hypercoagulable state needs to be evaluated for prevention of further thrombosis of other hepatic veins or re occlusion after interventional radiological management / shunt / transplant. The prevention of cirrhosis involves essentially involves counseling in alcoholics, vaccination for Hepatitis B, and precautions for Hepatitis C and treatment of patients with NAFL (to prevent progression to NAFLD). In addition, all patients diagnosed with viral hepatitis( B, C and D) or chronic liver disease due to any etiology require management by specialized gastroenterogy / hepatology units with the aim of halting the progression of disease and early management of complications. The prevention of index bleeding in cirrhotics or other causes of PHT in patients who are diagnosed prior to bleeding is important. Primary prophylaxis is administered to patients at high risk of bleeding. These patients have large varices, red wale markings on the varices, and severe liver failure. Individualize dose. 20 mg PO bid average dose; initiate 10 mg PO q12h, adjusting dose q3-4d until heart rate is reduced by 25%, provided it does not drop below 55 bpm or systolic arterial pressure does not drop below 90 mm Hg . Response to treatment is monitored by a reduction of the portal pressure gradient by more than 20% of the baseline value or less than 12 mm Hg. Checking the HVPG response in primary prophylaxis is not mandatory because 60% of patients who do not achieve these targets do not bleed at 2-year follow-up evaluations. Propranolol is contraindicated in patients with asthma, chronic obstructive pulmonary disease (COPD), atrioventricular (AV) block, intermittent claudication, and psychosis. Beta-blockers are best continued for the patient’s lifetime because the risk of variceal hemorrhage returns to that of the untreated population once beta-blockers are withdrawn. Available evidence does not support the use of Isosorbide mononitrate ISMN as monotherapy for primary prophylaxis, even in patients with contraindications or intolerance to beta-blockers. This involves both beta-blockers and ISMN. Combination therapy cannot be recommended presently until further studies prove efficacy. No role in primary prophylaxis except perhaps in patients with EHPVO who have ‘dangerous’ varices and live far from tertiary medical centres. Prophylactic EVL currently cannot be recommended as a routine measure for primary prevention but may be an option for patients with grade 3-4 varices who have contraindications to or cannot tolerate beta-blockers. Variceal hemorrhage is diagnosed when patients present with upper gastrointestinal hemorrhage in the background of preexisting chronic liver disease or cirrhosis or in patients in 1st decades of life for EHO and 2nd and 3rd decade who present with UGI bleeding associated with splenomegaly usually in the absence of any associated features of chronic liver disease. Secure respiratory tract patency, if needed endotracheal intubation may be done. Place two wide bore 16G intravenous lines preferably in the antecubital fossae and consider central venous line insertion. 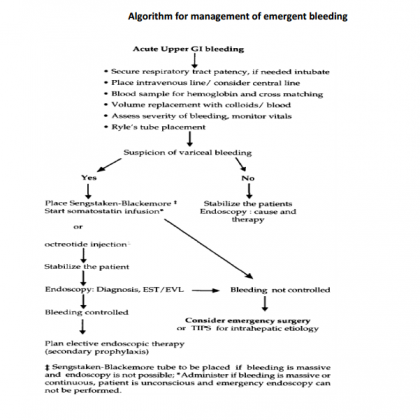 Assess severity of bleeding, monitor vitals. Blood sample for hemoglobin and cross matching. Volume replacement with colloids/blood, guided initially, by blood pressure and urine output and central venous pressure(CVP) if possible. It is important to avoid under- than over-transfuse to avoid excessive intravascular volume and variceal expansion and consequent rebleeding. Blood should be replaced at a modest target of HCT (hematocrit) of 25-30%. All patients with cirrhosis and upper GI bleeding are at a high risk of developing severe bacterial infections, which are associated with early rebleeding. The use of prophylactic antibiotics has been demonstrated to decrease the rate of bacterial infections and increase survival rates, thus prophylactic antibiotic use (norfloxacin 400 mg PO bid for 7 d; ciprofloxacin and other broad-spectrum antibiotics) in the setting of acute bleeding is recommended. This acts by decreasing splanchnic blood flow Octreotide is a synthetic analogue of somatostatin that is usually administered at a constant infusion of 50 mcg/h. The use of vasopressin is limited by adverse effects related to splanchnic vasoconstriction (eg, bowel ischaemia) and systemic vasoconstriction (eg, hypertension, myocardial ischemia). Continuous infusion of 0.2-0.4 IU/min (not exceeding 0.8 IU/min) is recommended. Vasopressin always should be accompanied by intravenous nitroglycerin at a dose of 40 mcg/min (not to exceed 400 mcg/min) to maintain systolic blood pressure greater than 90 mm Hg. Adding nitrates to vasopressin therapy improves its efficacy, although the adverse effects of combination therapy are higher than those associated with terlipressin or somatostatin. Based on availability of expertise and equipment. If the bleeding continues the Endoscopic therapy with sclerotherapy or band ligation should be attempted. In the absence of expertise or rebleeding after initial control Balloon tamponade should be instituted and the patient referred to higher center. 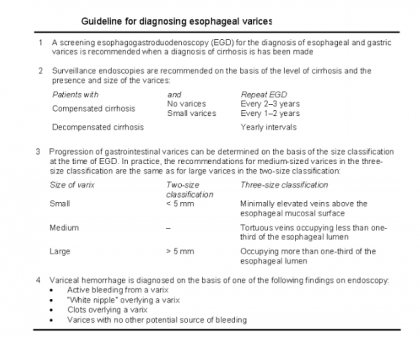 The definitive diagnosis of variceal haemorrhage is done by demonstrating varices on esophagogastroscopy which should be done after adequate resuscitation and stabilization. Imaging of liver by ultrasound or CT scan is also done after initial resuscitation. Following emergent treatment, the etiology of portal hypertension or cirrhosis needs to be identified. EHPVO is diagnosed by clinical presentation with preserved liver functions and splenomegaly with varices along with demonstration on USG Doppler of portal vein thrombosis or portal cavernoma formation. Similarly aforementioned presentation with normal liver function and normal portal vein with normal liver on ultrasound is considered sufficient for diagnosis of NCPF. Doppler is also used for diagnosis of HVOTO which may be supplemented by venography. Etiology of cirrhosis is identified by history of alcoholism , liver functions and viral serology, PCR, autoantibodies and tests for Wilsons disease and hemochromatosis. Liver biopsy may be needed in various situations. Following resuscitation, treatment of acute variceal bleeding includes control of bleeding (24 h without bleeding within the first 48 h after starting therapy) and prevention of early recurrence. Terlipressin,a synthetic analogue of vasopressin which is also useful during an acute bleeding episode. Dosage 0.5 mg to 2mg QID by slow IV infusion Vasopressin The use of vasopressin is limited by adverse effects related to splanchnic vasoconstriction (eg, bowel ischaemia) and systemic vasoconstriction (eg, hypertension, myocardial ischemia). Continuous infusion of 0.2-0.4 IU/min (not exceeding 0.8 IU/min) is recommended. Vasopressin always should be accompanied by intravenous nitroglycerin at a dose of 40 mcg/min (not to exceed 400 mcg/min) to maintain systolic blood pressure greater than 90 mm Hg. Adding nitrates to vasopressin therapy improves its efficacy, although the adverse effects of combination therapy are higher than those associated with terlipressin or somatostatin. .
Endoscopic therapy is a very effective emergency treatment for acute oesophageal variceal bleeding (though not optimal for patients bleeding from gastric fundal varices). Failures of endoscopic treatments may be managed by a second session of endoscopic treatment, but no more than two sessions should be undertaken before deciding to insert a transjugular intrahepatic portosystemic shunt(TIPS) or perform surgery. Endoscopic variceal ligation (EVL) is achieved by a banding device attached to the tip of the endoscope. The varix is aspirated into the banding chamber, and a trip wire dislodges the carried rubber band, ligating the entrapped varix. One to three bands are applied to each varix, resulting in thrombosis. EVL is less prone to complications than injection sclerotherapy. However it has the same limitations of availability, cost, and difficulty in treating gastric varices as sclerotherapy. Endoscopic injection sclerotherapy – Injecting a sclerosant solution into the bleeding varix, obliterating the lumen by thrombosis, or into the overlying submucosa. Sclerosants include 5% sodium morrhuate, 1% to 3% sodium tetradecyl sulphate, and 5% ethanolamine oleate. The typical volume used per injection is 1-2 mL of sclerosant, with the total volume ranging from 10-15 mL. Although ligation is being considered the treatment of choice for esophageal varices, the choice of technique should be left up to the experience of the operator, as well as the particular circumstances found during endoscopic therapy. Balloon-tube tamponade should be used only in massive bleeding as a temporizing measure (less than 48 hours) until definitive treatment can be instituted. Continued bleeding during balloon tamponade indicates an incorrectly positioned tube or bleeding from another source. The Sengstaken-Blakemore (S-B) tube has three lumens – one for gastric aspiration and two to inflate the gastric and esophageal balloons.. The tube is inserted through the mouth, and its position within the stomach is checked by auscultation while injecting air through the gastric lumen. The gastric balloon is inflated with 200 mL of air. Once fully inflated, the gastric balloon is pulled up against the oesophagogastric junction, using approximately 0.5 kg of traction, compressing the submucosal varices. Oesophageal balloon inflation however is rarely required. A plain X ray of the abdomen is performed to confirm the position of the inflated gastric balloon. The tube is usually removed before 48 h to permit definite evaluation by UGIE. The Minnesota tube is an adaptation of the SB tube, the difference is that it has and additional oesophageal suction port to prevent aspiration. Endoscopic administration of cyanoacrylate monomer (superglue) is indicated in gastric varices. TIPS is a useful procedure for bleeding which continues despite medical and endoscopic treatment in Child’s C patients and selected patients with Child class B disease. Under local anaesthesia with sedation, the hepatic vein is cannulated with a needle via the internal jugular vein and a tract is created through the liver parenchyma from the hepatic to the portal vein. This is performed under ultrasonographic and fluoroscopic guidance. The tract is dilated, and an expandable metal stent is introduced, connecting the hepatic and portal systems. Blood from the hypertensive portal vein and sinusoidal bed is shunted to the hepatic vein. (1) active variceal bleeding despite emergency endoscopic and/or pharmacological treatment. (2) recurrent variceal bleeding despite adequate endoscopic treatment. Potential indications include (a) isolated bleeding from gastric fundal varices and (b) refractory ascites. TIPS is a viable option and is less invasive for those whose bleeding is not controlled. However, if TIPS is not available, then staple transection of the esophagus is an option when endoscopic treatment and pharmacological therapy have failed. Patients with PHT may require emergency surgical intervention when endoscopic and/or pharmacotherapy and SBT fail to arrest acute variceal bleeding. The objective of emergency surgery is to control bleeding from the varices. The most important factor in choosing the surgical option in patients with uncontrolled variceal bleeding is the experience of the surgeon and the underlying etiology of PHT. Shunt procedures have high control rates of bleeding and low rebleeding rates, therefore should be an option of choice in experienced hands in patients a with suitable venous anatomy. Patients with unshuntable anatomy and poor liver function (Child’s B or C) should only be subjected to nonshunt procedures such as gastroesophageal devascularization with or without gastroesophageal transection, partial esophagogastrectomy and transthoracic ligation of varices. These procedures however are associated with a higher rebleeding rates. This usually is performed at weekly intervals.Approximately 4-5 sessions are required for eradication of varices, which is achieved in nearly 70% of patients. EVL is considered the endoscopic treatment of choice in the prevention of rebleeding. Sessions are repeated at 7- to 14-day intervals until variceal obliteration (usually 2-4 sessions). Major complications of EST are retrosternal discomfort (30%), esophageal ulcerations (18-30%o) and strictures (6-16%); and transient pyrexia (39%). Serious complications like esophageal perforation and mediastinitis can rarely occur. EVL plus nadolol plus sucralfate is more effective in preventing variceal rebleeding than EVL alone. Combination of EVL with beta-blockers seems to be reasonable for patients in whom pharmacological therapy has failed. For prevention of rebleeding, when pharmacological therapy and/or endoscopic therapy have failed, consider surgery. Failure is defined as a single episode of clinically significant rebleeding (transfusion requirement of 2 U of blood or more within 24 h, a systolic blood pressure <100 mm Hg or a postural change of >20 mm Hg, and/or pulse rate greater than 100 bpm). When the patient lives far from tertiary medical care cannot come for regular follow up with endoscopy there is a role for early shunt procedures in those with non cirrhotic portal hypertension with documented massive hematemesis and especially when there is growth retardation . These patients have normal liver function therefore, no risk of post- shunt hepatic decompensation and encephalopathy; and tolerate surgery well. Indications of surgery in this group of children with EHPVO would be failure to control acute variceal bleeding by non- surgical methods, gastric varices (bleeding or large size), significant hypersplenism, bleeding ectopic varices and isolated splenic vein thrombosis. Each patient with EHPVO needs to be individualized for appropriate therapy. Children with PHT due to other non- cirrhotic conditions like congenital hepatic fibrosis and non- cirrhotic portal fibrosis may be managed on similar guidelines of EHPVO as these cases are expected to have well preserved liver function. Operations have the added advantages of being one time procedures, they reverse the problems associated with splenomegaly and improve post-operative growth parameters. Surgical procedures performed are shunt and nonshunt operations. The shunt procedures are designed to divert blood from the high-pressure portal venous to the low pressure systemic system. They have been divided into non-selective shunts; selective shunts, partial shunts and the more recently introduced “Rex shunt”(mesenterico-left portal bypass). These include any direct anastomosis between shunt between the portal vein (or one of its main tributaries) and the IVC (or one of its tributaries).The non-selective shunts completely decompress the entire portal venous system and divert all portal blood flow away from the liver. These are end-to-side and side-to-side portacaval shunts; central lienorenal shunts, mesocaval shunts and the large diameter interposition portacaval or mesocaval shunts. These shunts achieve effective control of bleeding. However a major concern with them is that they may precipitate encephalopathy (rate of 40-50% in cirrhotics) and progressive liver failure. The procedure has relatively limited indications, which include massive variceal bleeding with ascites or acute Budd-Chiari syndrome without evidence of liver failure. Splenectomy with a central lienorenal shunt has not been found to be associated with an increased risk of post- splenectomy sepsis. The “Rex shunt” restores the physiological hepatopetal flow by interposing a jugular venous allograft between the superior mesenteric vein and the intrahepatic left portal vein. This shunt has been initially used for treating portal vein thrombosis after liver transplantation and its application has been extended to primary portal vein thrombosis. These reduce the size of the anastomosis of a side-to-side shunt to 8 mm in diameter. Portal pressure is reduced to 12 mm Hg, and portal flow is maintained in 80% of patients. The operative approach is similar to side-to-side portacaval shunts, except the interposition graft must be placed between the portal vein and the IVC. The selective shunts compartmentalize the portal venous system into a decompressed gastrosplenic and hypertensive superior mesenteric circuit, thus maintaining portal perfusion. For instance a distal splenorenal shunt (Warren shunt) is a selective shunt used primarily in patients who present with refractory bleeding and continue to have good liver function. This shunt provides the best long-term maintenance of some portal flow and liver function with a lower incidence of encephalopathy (10-15%) compared to total shunts. The operation produces ascites because the retroperitoneal lymphatics are diverted. A subgroup(approximately 5-10%) of patients with EHPVO have no suitable veins for shunting due to extensive thrombosis of the splenoportal axis, prior splenectomy or a previously performed but failed shunt procedure. This group poses special management problems. They merit non-surgical management and in case of its failure would necessitate non-shunt surgical procedures. These include splenectomy, gastroesophageal devascularization, and, occasionally, esophageal transection. The incidence of liver failure and encephalopathy is low following devascularization procedures, presumably because of better maintenance of the portal flow. This should not be performed except in patients with gastric varices and isolated left sided portal hypertension following splenic vein thrombosis(usually following chronic pancreatitis. In them it is a curative procedure. The spleen is one of the major inflow paths to gastroesophageal varices. In this the whole greater curve of the stomach from the pylorus to the esophagus and the upper two thirds of the lesser curve of the stomach; the esophagus is devascularized for a minimum of 7 cm via a thoracic approach upto the level of the inferior pulmonary vein.